WHERE THERE IS FUN FOR EVERYONE OF ALL AGES! DAILY GUIDED SAFARI TOURS (OVER 700 ANIMALS)! Get ready to see super-exotic animals and previously endangered species that now enjoy their place in this natural preserve setting. Out on the range, interact with hordes of friendly animals that run up to greet you (that may lick or even ‘kiss’ you) as you hand-feed them to your heart’s content. Don’t forget to purchase a bucket at the office! Afterwards, let loose, relax, and look forward to enjoying even more playful animals in one of our petting zoos… All this and more, will give you, your family, and friends a truly unique and personal zoo encounter. Your children and grandchildren alike will share their sense of wonder and excitement on what they will see next! Don’t forget to pick up a memorable souvenir in our newly-renovated gift shop! An independently-owned and operated zoo safari resort & preserve, where several endangered species of animals have a chance to increase their numbers, while also allowing visitors like you to safely enjoy their company and natural beauty. The commitment of the Exotic Resort Zoo is to maintain a healthy and nurturing environment to help our animals enjoy their lives, as they grow their herds and get to enjoy being hand fed by all of you on daily guided tours. You are absolutely guaranteed to have a unique and personal hands-on experience when you visit us with all your family and friends! Before you go out on tour, make sure to get at least one bucket of feed (or more for larger groups and families)! 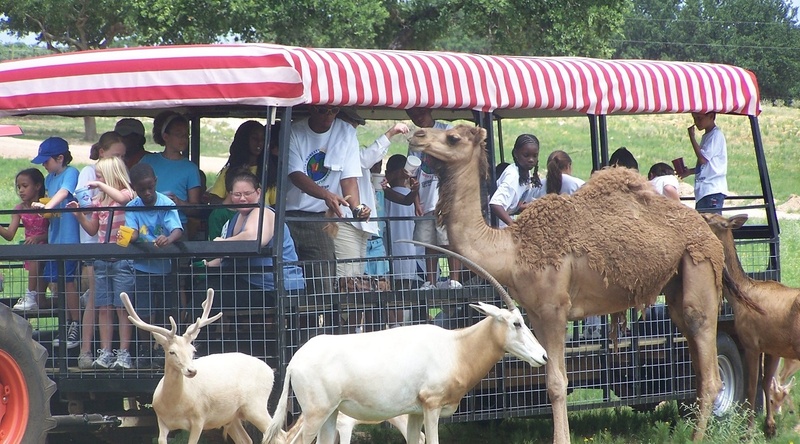 Having feed will enhance your interaction with our crowd-favorite Camels, American Bison, Ostriches and even Zebras. View our growing herd of Greater Kudu antelope with impressive spiraling horns that can grow to a 6′ span! Directly feed our American Bison and Scottish Highlanders (drop the feed in their mouths or let ’em lick you)! Or watch a mother cleaning her new-born…and see them take their first steps in this natural and inviting habitat. You may even see a little joey peek out of a kangaroo pouch if you stay with us at our cabins and get to walk right up to their home! Scope out the Safari Cabins with private access to many amenities, including a catch-and-release pond as you stroll past our kangaroo exhibit. Don’t miss out!! See what others are saying about their experiences at The Exotic Resort Zoo & Safari Cabins! Come and visit us for a memorable tour today – or book your stay at one of our scenic safari cabins (a free tour included for paid guests)!